Our Virtual Acne Free Skin Program was designed for clients who don’t live anywhere near to our office and need help to clear up their acne.You will receive professional advice from an Acne Specialist in the comfort of your own home. We will provide virtual consultation through FaceTime® or Skype to help you learn about what causing your acne and teach you how to keep it under control. During this online consultation, you will receive the same information that you would get in our in-clinic appointment. The Acne Free Skin Program and PoreInfusion products were created for people who are absolutely excited and serious about getting their acne under control. They are ready to end their struggles and frustrations of being embarrassed by their own skin. We know the best way to achieve clear skin. 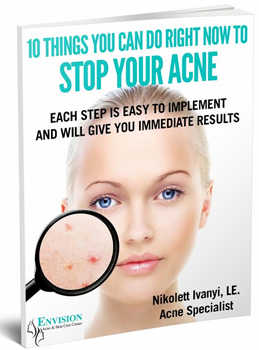 You will have your own Acne Specialist who will give you step by step directions throughout the process. Achieving acne free, clear skin is not an overnight process!!! It requires patience and compliance. But if you follow our recommendations and be consistent with your home-care, you will achieve great results. This program works best for clients with inflamed and cystic breakouts. If you are a new client but not quite ready yet to get started with our Acne Free Skin Program but would like to start using some of the PoreInfusion products to help your skin, we highly recommend to schedule a FREE 15 minute phone or virtual consultation so we can recommend products that are best suited for your skin. If you would like to talk to a specialist and find out which products are best for you Click Here to schedule a call. This program is a combination of using PoreInfusion home care products and receiving a guidance of an acne specialist to help you achieve clear, acne free skin. You will receive a customized home care protocol and lots of helpful information on how to clear up your skin. While most in-office clients will clear up in about 10-14 weeks, for long-distance clients it usually takes a little longer. Because long distance clients are not able to receive treatments and regular extractions this program works best for those who doesn’t need lots of extraction and mostly have inflamed, cystic acne. Click here to read about our first Consultation. For long distance clients who cannot come in for in-office treatments. The same consultation that you would receive in the clinic. We will review your intake Forms. We will go over your skin concerns/ goals. Review lifestyle and diet recommendations. You will receive a home-care plan customized for your acne type, along with product suggestions from the PoreInfusion skin care line with step-by-step home care instructions. One follow-up phone call a week after your initial consultation to check your progress. If you decide to participate in our long distance acne program you will need to budget around $150 – $175, for your initial “need to have” products (include 6-8 products.) These products last 2-3 months on average. This program will include 6 check-in sessions to update your home care and to address any concerns you have with your skin. These are 15 minutes prescheduled sessions once every 2 weeks that will be held through phone, FaceTime® or Skype, whichever you prefer. These sessions are going to be very important to achieve your skin care goals. We have to switch up you routine on how you use your products morning and night every 2 weeks otherwise your skin will adapt to the products and will not clear up. Depending on how your skin progressing we either strengthen your routine or have you back up with the exfoliation. If you fail to fill out these forms your appointment may not be guaranteed. Who is this program for and what is expected from me? This program works best for those who suffer from moderate to severe inflamed acne. Our long distance program and PoreInfusion products were created for people who are absolutely excited and serious about getting their acne under control. They are ready to end their struggles and frustrations of being embarrassed by their own skin. They were created for you to get your skin clear which will eventually lead you to regain your self-confidence, look better, feel better and live a better life. Achieving acne free, clear skin is not an overnight process!!! It requires patience and compliance. But if you follow our recommendations and be consistent with your home-care, you will achieve great results. Consider it to be a learning course as well. You will be expected to take serious and consistent action. No excuses anymore, just a different way of taking care of your skin and full support while you achieve this incredibly exciting goal: clear, acne free skin. You are a product junkie and loves to jump from one product brand to another. You are only willing to use organic or DIY skincare products. You break out occasionally. This program is best suited for moderate to severe acne skin that breaks out on a daily basis with new inflamed lesions or cysts. If you are allergic to Benzoyl Peroxide. You are not ready to let go of control and follow our advice. If you’re not 100% committed then we can’t work together. This program only delivers results to those that commit to every aspect of the program. We take our profession very seriously and provide you with all the guidance you need to achieve clear skin, but it is our experience that if you are not 100% committed to the program you will never achieve the results you are looking for. We are very compassionate and empathetic with all of our clients. Most of our therapists at our clinic have suffered from acne so we know what you are going through. We are unlike busy doctors who don’t have the time to spend an hour with you to evaluate your complex skin problems. We take our time with you and listen to all of your skin concerns. We monitor your progress and always return a phone call whenever you need assistance with the program. We encourage you to contact us whenever you feel you are not on the right track or something is not working with your skin. We work with the best acne products available to treat your skin. All home care protocols will be created for your skin on an individual basis. As your skin changes so will your protocol! We have the best acne products that do not require a prescription. We will answer all your skin care questions and if we don’t know the answer, we will research it for you. We will be in close contact with you throughout your process of getting clear. This will include personalized home care products, follow up phone conversations and email support anytime you need. Visit our Testimonial Page or Facebook page to read what our clients are saying about our program.